Since the installation of the new Dutch House of Representatives on 23 March 2017, 3,666 tweets have been deleted by parliamentarians. Relatively, politicians from the PVV (1 out of 10 posted messages), DENK (1 out of 12) and Forum for Democracy (1 out of 14) removed the most messages. With Politwoops, automatically deleted tweets of politicians are archived, made searchable and show real-time statistics. This shows how quickly a message has been removed, when, which politicians and political parties remove relatively the most. Geert Wilders removed most tweets (813). He is followed by VVD parliamentarian Daniel Koerhuis (159) and Forum for Democracy party leader Thierry Baudet (150). Members of parliament Nevin Özütok (117), Peter Kwint (111), Martin Bosma (104) and Zihni Özdil (101) also removed more than 100 messages during this period. During the election campaign earlier this year, more messages were posted and removed by politicians and candidates than in the period after. The PVV, DENK and Forum for Democracy relatively deleted most tweets. The PVV removed one of every 10 posted tweets. DENK removed 1 in 12 and Forum for Democracy removed a message from every 14 placed tweets. Members of the PvdA and the Christian Union removed 1 in 104 and 1 in 79 tweets, respectively. Geert Wilders is most adept at removing retweets from his own messages and then tweeting them again. So he removed 630 retweets from his own messages. PVV politician Leon de Jong also removes his own retweets. He did this with 33 messages. When it comes to removing messages on Twitter, the gentlemen in The Hague do more than women. That may not be strange because they themselves also have more tweets. 64% of all 102,290 messages are from the men. They removed 2,520 messages since their installation in March. That a lot was reported with the hashtags #government agreement, the #government statement and #formation is not that surprising. But most messages were placed with the hashtag #fvd. There was also a lot of tweeting about #dividend tax, # cop23 and #kamerwatch. Messages with the hashtags #teha, #stopislam and #stoprutte from Geert Wilders were removed the most, usually to be retweeted again. The hashtag #fakenewsnrc by Thierry Baudet was also deleted for the same reason. In addition to these hashtags, especially tweets with the hashtag # 12points (referring to the Eurovision Song Contest) were removed by members of the House of Representatives. Tuesday is usually a good day for members of parliament to post a message while at the end of the parliamentary week on Thursday most tweets are deleted. During the elections earlier this year, the deleted messages from candidates were also archived. The Twitter behavior in this period is significantly different than in the period after. 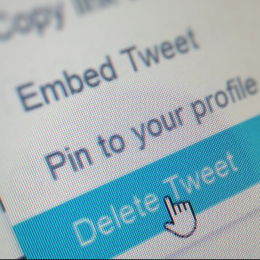 Since 2010, deleted tweets from politicians have been collected and published with Politwoops. Open State Foundation collects and stores with this tool deleted tweets from politicians in 54 countries and the European Parliament. Open State Foundation works together with ProPublica for the American version. These websites are often used by journalists and others, especially during elections.